Families will receive e-mails providing important information throughout the season. Make sure that your email address is up to date in our customer portal to ensure that you are receiving this important information. General Attire Guidelines: Students must wear appropriate dance shoes and attire to class. Please label dancewear and all dance shoes with dancer's name. T-shirts and shorts should be worn to class as a cover-up but are not permitted in technique class. Hair must be pulled off the face and shoulders. Ponytails and buns are appropriate hairstyles for class. Jewelry of any kind is not allowed in class. A limited selection of leotards and tights are available for purchase at the front desk. I, , certify that I am the parent or legal guardian of ("Minor"), who is a minor. In consideration for my child being able to participate in the programs and activities offered at THAT'S DANCING, AMPetro, INC., I agree on my own behalf and on behalf of Minor to release, waive, discharge and covenant not to sue THAT'S DANCING, AMPetro, INC. along with its officers, directors, board members, supervisors, agents, servants or employees (collectively referred to here as "Releasee") from any and all liabilities, claims, demands or causes of action that may arise from or be related to any loss, damage or injury, including death that may be sustained by Minor or Minor's personal property while Minor is participating in THAT'S DANCING, AMPetro, INC.'s programs or activities or while Minor is on its premises located at A-15 Jog Road, Lake Worth, Florida 33467 (the "Premises"). I further release, on my own behalf and on behalf of Minor, THAT'S DANCING, AMPetro, INC. from claims for negligence. To the best of my knowledge, Minor is in good physical condition, and I have no knowledge of any physical condition, injury or illness whatsoever which would place Minor at risk to participate in the THAT'S DANCING, AMPetro, INC's programs and activities. I am fully aware of the risks connected with participating in the programs and activities at THAT'S DANCING, AMPetro, INC. I voluntarily assume full responsibility for any risk of loss, property damage or personal injury, including death, that Minor may sustain as a result of participating in THAT'S DANCING, AMPetro, INC.'s programs and activities, however caused. I further agree to indemnify and hold harmless Releasee from any loss, liability, damage or cost, including court costs and attorneys' fees, that may accrue related to Minor's participation in THAT'S DANCING, AMPetro, INC.'s programs and activities, however caused. While Minor is attending THAT'S DANCING, AMPetro, INC., I give permission for the staff of THAT'S DANCING, AMPetro, INC. to administer appropriate medical attention to Minor in the event of any accident, illness or injury. I will be responsible for any and all costs of medical care and treatment that may be provided, except for care and treatment covered by my insurance. This instrument shall be binding upon the members of my family, my spouse and my heirs, assigns and personal representatives. This Release and disputes arising thereunder shall be governed by the law of the State of Florida. I understand that this waiver and consent form applies to all future visits to the Premises in addition to all future THAT'S DANCING, AMPetro, INC. programs and activities. I agree, on my own behalf and on Minor's behalf, to arbitrate all matters that arise out of this Release. This Release contains the entire agreement between the parties to this agreement, and the terms of this Release are contractual and not a mere recital. This Release is executed this date, by ("Releasor"). In consideration of being permitted to participate in programs/activities conducted by THAT'S DANCING, AMPetro, INC., Releasor, for himself/herself and his/her personal representatives, heirs and next of kin, releases, waives, discharges and covenants not to sue THAT'S DANCING, AMPetro, INC., its officers, directors, board members, supervisors, agents, servants or employees (collectively "Releasee") from any and all liability to the Releasor, his/her personal representative, assigns, heirs and next of kin for loss or damage, and any claim or damage therefor, on account of injury to the person or property resulting in death of the Releasor, whether caused by the negligence of Releasee or otherwise while the Releasor is involved in programs, activities or any other purpose at THAT'S DANCING, AMPetro, INC.
Releasor agrees to indemnify Realeasee from any loss, liability, damage or cost Releasee may incur due to the presence of Releasor in or on THAT'S DANCING, AMPetro, INC., located at A-15 Jog Road, Lake Worth, Florida 33467 (the "Premises"), whether caused by the negligence of the Releasee or otherwise. Releasor assumes full responsibility for and risk of bodily injury, death or property damage due to negligence of Releasee or otherwise while in or on Premises and/or while competing, officiating in, working or for any purpose participating in programs and activities for THAT'S DANCING, AMPetro, INC.
Releasor agrees that this release, waiver and indemnity agreement is intended to be as broad and inclusive as permitted by the laws of the State of Florida and that if any portion of the agreement is held invalid, it is agreed that the balance shall, notwithstanding, continue in full legal force and effect. Releasor, being of lawful age, in consideration of being permitted to participate in THAT'S DANCING, AMPetro, INC.'s programs and activities, does for himself/herself, his/her heirs, executors, administrators and assigns, now releases and forever discharges Releasee, their heirs, administrators and executors of and from any and every claim, demand, action or right of action, of whatsoever kind or nature, either in law or equity arising from or by reason of any bodily injury or personal injuries known or unknown, death and/or property damage resulting or to result from any accident which may occur as a result of participation in THAT'S DANCING, AMPetro, INC.'s programs and activities or any activities in connection with THAT'S DANCING, AMPetro, INC., whether by negligence or not. Releasor further releases Releasee from any claim whatsoever on account of first aid, medical treatment or service rendered him/her during participation in THAT'S DANCING, AMPetro, INC.'s programs and activities. I understand that this Release applies to all future visits to the Premises in addition to all future THAT'S DANCING, AMPetro, INC. programs and activities. I agree to arbitrate all matters that arise out of this Release. Release executed by ("Releasor") in favor of THAT'S DANCING, AMPetro, INC. ("Releasee"). In consideration for participation in THAT'S DANCING, AMPetro, INC.'s programs and activities, Releasor consents to being the subject of the photographs of Releasee, together with any subject matter owned by Releasor, and authorizes Releasee to cause the same to be exhibited, with or without advertising sponsorship, as still photographs, transparencies, motion pictures, television, video or other similar media. Releasor releases Releasee, and any associates, as well as any and all officers, directors, board members, assigns, agents, servants and employees from any and all claims for damages for libel, slander, defamation, invasion of privacy or any other claim based on use of the above-described materials. A family discount of $5 will be taken off the second student's monthly total. A sibling discount of 10% will be applied for more than one sibling on unlimited hours. Annual tuition will be discounted by 10% if paid in full on or before October 1st. 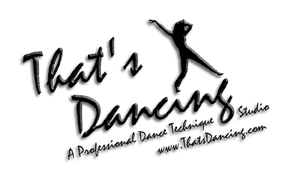 Private Lessons: $35 per ½ hour for That's Dancing students & $45 per ½ hour for non-students. Semi-Private Lessons: $25 per student per ½ hour for students & $35 per student per ½ hour for non-students. Private lessons must be paid when scheduled. 24 hour notice of cancellation is required or full lesson price will apply. The nine month session includes 36 classes which includes a dress rehearsal. Tuition is due on or before the first day of every month. Automatic Payment is available for your convenience. We recommend this form of payment for managing your tuition fees & avoiding late charges. Tuition that is not paid on time for any reason will incur a late fee service charge of $15. Please make sure that your tuition is paid on or before the 1st day of every month to avoid this service charge. Late charges are assessed on the 11th of every month. If you choose not to use automatic payment, tuition can by paid by cash, Visa, MasterCard, Debit Card or check, payable to That's Dancing. All tuition payments are due on or before the 1st day of each month. That's Dancing will only send billing statements to delinquent account holders, notifying them of non-payment and late fee service charges. Students of delinquent account holders will not permitted in class until accounts are brought up to date. *Students interested in becoming student helpers must complete the application process. Applications are available from Ms. Jessica and Ms. Katherine and student helpers will be assigned according to qualifications and need. Student helper discount is $6 an hour. Applicants will be notified 2 weeks prior to the session. Tuition that is not paid on time for any reason, including a dancer missing their scheduled class will incur a late fee service charge of $15. Please make sure that your tuition is paid on or before the 1st day of every month to avoid this service charge. The service charge will appear on the 11th day of every month to all delinquent accounts. Checks should be made payable to That's Dancing, with drivers license number written on the check. The check should also include the name of the student. A $25 fee (and any additional court costs if necessary) will be assessed on all returned checks. Tuition is not pro-rated for absenses. Please review the Make-up policies below. Attendance and Make-up Classes - Students should arrive promptly for their scheduled class. Good attendance is imperative for proper training. Excessive absences and tardiness can hamper the progress of the entire class. If a student will be missing class, please notify the front desk at (561) 642-9677. It is the student's responsibility to make-up the missed class and learn the missed material. Make-up classes are not permitted during observation week. Cancellation Policy - If you decide not to continue classes, we will need to know in writing before tuition is due for the month. Otherwise we assume that you will be attending and will be billed accordingly. If a student does not attend class the first two weeks of the month and tuition is not paid, the student will be dropped from the class without notification and a space will become available for other students. Gala tickets, or purchase other items for sale. Legal action will be taken for all accounts 60 days past due. Court costs are the responsibility of the billing contact. "¢ Registration Fees are non-refundable. "¢ Costume payments are non-refundable.